My tryst with King Cobra …..
Snakes have always fascinated me since my childhood days in mid-90s……they are a fascinating creature whose slithering movement sends a chill down the spine of most brave-heart man or woman.Even while watching snakes on Discovery Channel can be quite a daunting task for some people.Imagine watching snakes on TV and realizing that one of their brethren is slithering in your bedroom can be a horrifying experience. So, Yesterday a naughty Common Cobra visited my home ….It was planning to have a dinner time chat with me in my kitchen garden. But, actually a desi dog played spoilsport.It discovered it slithering near some trees on water-soaked soil in my backyard. 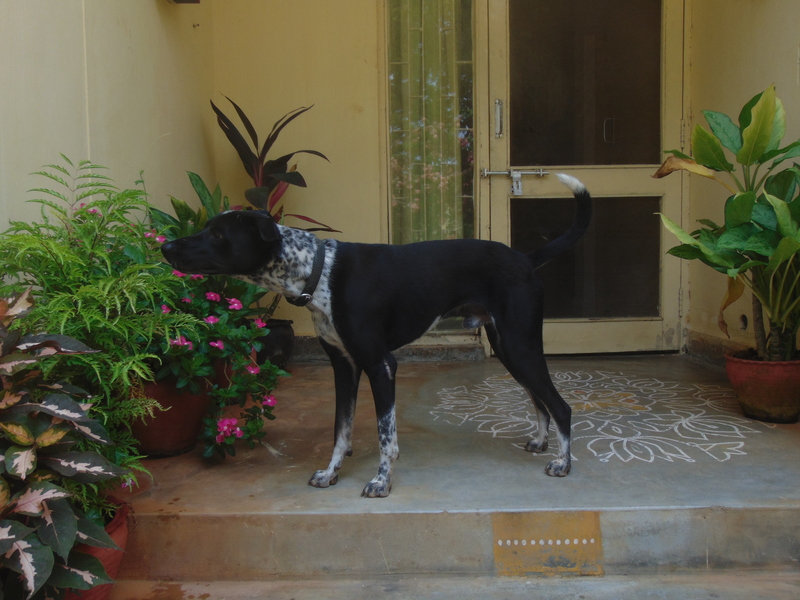 Kalu is a one year old pet dog guarding my home within a defined boundary wall during my absence round-the-clock. He hasn’t asked for any benefits or salary from me till date…….he gets his yearly dose of injections and lives happily with me …eating my leftover food and barks on my command. I live in a leafy neighbourhood called Simhadri and summer seasons bring various species of snakes/frogs/insects near my home. Till date, Kalu has killed 03-04 frogs and now all species of frogs are terrified by him and gone to other houses leaving the fertile soil of my kitchen garden. 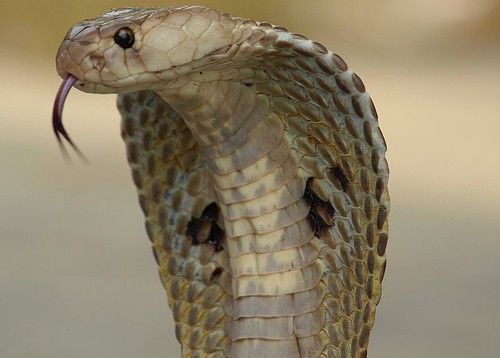 But, before talking about this Cobra, it is my duty to enhance your knowledge about Indian snakes in general as there are various superstitions floating around in our society. There are more than 270 species of snakes found in India and only a few of them are venomous enough to cause harm to Indians. We can classify the snakes as venomous (can cause probable death to a human being if bitten) mildly venomous (their venom is potent only to kill small prey animals) and non – venomous (they don’t have any venom or even venom glands).The Common Rat snake or Dhaman is most abundant snake found in India which is non-venomous. There are four common venomous snakes found in India. They are Common Cobra, Common Krait,Russel’s Viper and Saw scaled Viper. If bitten by these snakes, immediate medical help and doses of anti-venoms is required or else your soul is supposed to leave this planet within minutes. These are collectively called Big Four and they are spread all around the country from Bhuj to Kanyakumari. But the problem is correctly identifying this slithering demon as they don’t carry name tags with them. So, whenever I see a snake, 02 F’s come to my mind , Fear and Flight….3rd F i.e. Fight is out of the question. So, coming back to incident. Around 1830 hrs. yesterday, Kalu started barking on a walking rope which turned out to be King Cobra. Cobra means snake with hood. It is a Portuguese word.When disturbed, most of these snakes rear up and spread their necks (or hoods) in a characteristic threat display, making them a favorite of Naagin movies in Indian Cinema because of the dramatic effect. We realized this fact when Mr. Cobra felt threatened by unnecessary barking of a small dog and decided to teach him a lesson by hissing and showing his long tongue to Kalu. But kalu knew his own limitations as well as that of Mr. Cobra.He kept barking continuously and drummed the earth with his 02 front legs.He cornered Mr. Cobra near the wall and didn’t allowed to move from that stretched hooded position for nearly 45 minutes.Fortunately, this particular snake didn’t knew the technique of spitting venom long distances otherwise my beloved Kalu would have certainly received some poison from this angry snake. As, I realized from the facial expression of Mr. Cobra that he was pissed off on Kalu. This dog is certainly braver than me as I was way behind my dog. But, both of them realized that there is no benefit in hand-to-hand fight and so remained grounded to their position.Mr. Cobra was more pissed off because Kalu was much junior to him in age just a small dog basically a 01-year old puppy, whereas Mr. Cobra must be living in Andhra Pradesh since last 5-10 years. I say so because normally Cobras live up to 20 years and his length was around 6 ft. So, may be he was in middle age or mid-40s when compared to humans as normally length of cobras go up to 8-10 ft.
May be this was the primary reason for the anger and fury of Mr. Cobra. This was terrifying to me as watching the act of hissing live Cobra is far more dangerous than watching it on idiot box. Then, some of my friends brought a Carbon-dioxide filled fire extinguisher along with large sticks to kill Mr. Cobra. I was happy to see some well-wishers as watching hissing Cobra for 45 minutes without advertisement break had sapped my morale.It was also torturing for Kalu as he looked to me for helping defuse the tense situation.He was also thinking on lines of junior/senior concept in animal kingdom. But, I realized the futility of killing this beautiful and magnificent creature.It had not entered my drawing-room.It was may be just passing through bushes/leaves in my kitchen garden still thinking that this jungle area was his home. May be, he was right, Simhadri was a jungle when this bungalow was constructed on this land. 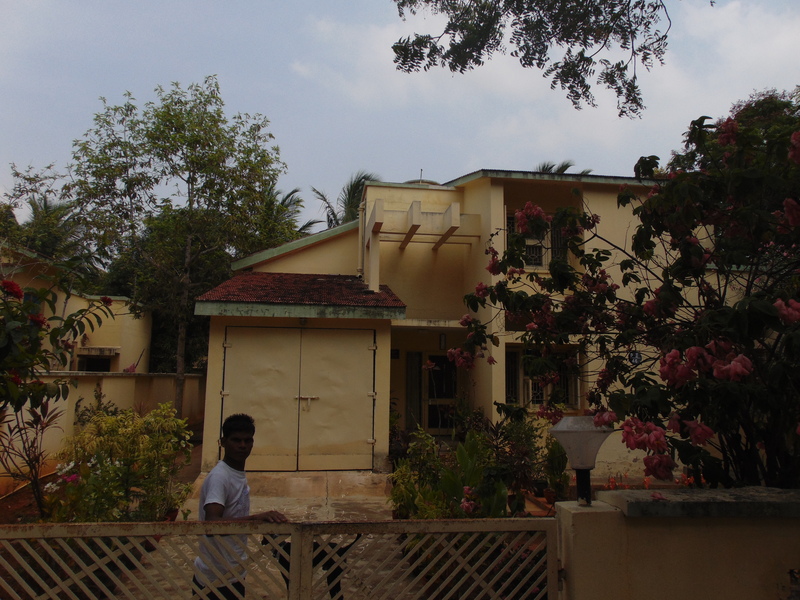 This land was the ancestral property of Mr. Cobra since generations,whereas this home was built just 10-15 years back. I have no idea about evolution of snakes or humans but guess that snakes must have evolved before the birth of Adam & Eve as snakes were roaming in their garden. So, why kill it ? Why not let it slither away to nearby jungle.Fortunately there were no children/ladies in my house as I am living the life of a forced bachelor nowadays.So, even if he comes to my drawing room in future, me & Kalu can deal with it.Kalu nodded his head and gave his barking assent to my decent proposal. So, ignoring the plea of neighbours ,I decided to give him a free passage. I controlled Kalu which was the only option as being my pet he was indebted to me which Mr. Cobra was not. My friends made the noise and Mr. Cobra went out slithering carefully and a dignified manner through a hole in my boundary wall. But, he entered into a drain in front of my Gate and decided to take rest after exhausting his energy in stretching such a wide hood for 45 minutes. This was dangerous as it can pose a threat to passersby and neighbours. 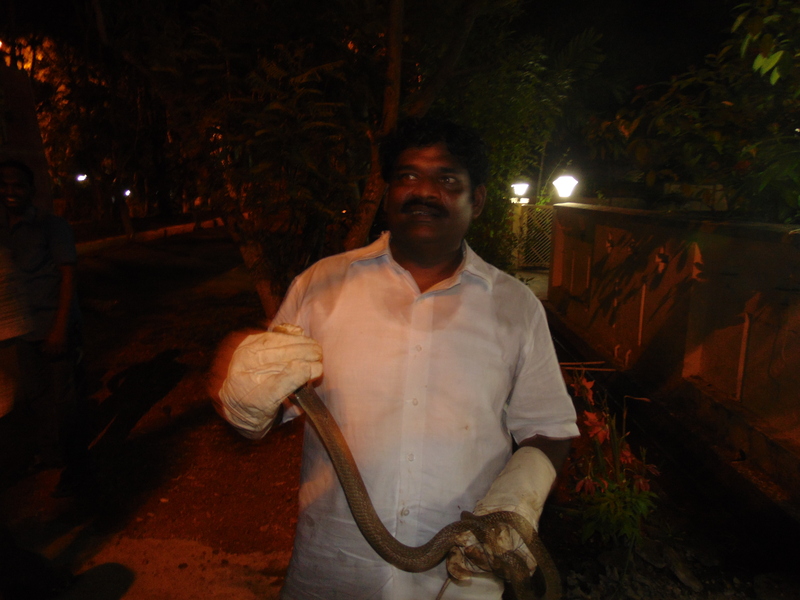 I telephoned a world-record holder snake catcher Mr. Kiran from Gajuwaka, Visakhapatnam. Gentleman arrived on the scene in 30-minutes and started probing the drain using bamboo stick but failed to get a response from Mr. Cobra. We tried to smoke him out but no response. We used phenyl-mixed water to drain him out but failed.We used streams of Carbon-dioxide fire extinguisher but no response. Mr. Cobra seemed to enjoy our collective anxiety and may be was smiling with his open mouth. This continued for nearly 02 hours as Mr. Cobra must be sleeping in a hole inside drain.Now, I was thinking that may be Mr. Cobra made fool of us and slithered away to a safe location. But, one of my neighbours suggested that water must be pumped in drain so that Mr. Cobra get a bath as well as comes out. A water tanker was summoned and sharp jets of water were pumped in the drain. Mr. Kiran waited on other side and bingo here comes the slightly grey/black beauty simmering brightly in torch-light,swimming in streams of white water.Watching a snake swimming in clear water is an ethereal experience.They just glide in it..no butterfly or breast-stroke required. Mr. Kiran captured him by tail first and gave few strokes of massage on Mr. Cobra’s head by using a stick.He rotated it quickly in a clockwise manner using his hand.Now, the brain of Mr. Cobra was feeling like he was on a roller-coaster ride and his resistance was gone.Mr. Kiran pressed his mouth/head and gave us opportunity to touch his soft skin and a lengthy photo-session followed.We took this opportunity to irritate Mr. Cobra as we knew that his powers were in control mode and so took the risk of messing with a King Cobra.But, Kalu was still apprehensive. Mr. Cobra was safely stored in a cloth bag and taken to his resting place in Vizag Zoo. Kalu started barking happily.He sniffed out the whole surroundings and made sure that no other reptiles were roaming in his territory. He was celebrating the combined success of dogs and humans.In fact, his level of happiness was more than mine. I realized that even dogs are happier than we humans. Sir, RIP Kalu. Now, I realise the significance and depth of your mourning that day. Love for pets is undoubtedly a two way affair.